The 2019 Somerset 'Cases' Rebels assembled for the first time at the club's well-attended Press and Practice Day on Wednesday and it was immediately apparent that there is a strong team spirit flourishing and the desire to work well together. New number one Rory Schlein admitted that he felt the structure of the side "ticked all the boxes" adding "I think it is good to have the right blend and here we have a good mix of enthusiasm and knowledge and there is no reason why we shouldn't live up to Garry's expectations. Captain Chris Harris added "I am feeling that there is already a good team spirit and that really goes a long way in building success. Clearly, we have some youngsters down at reserves but both me and Rory are willing to help and guide them, so long as they don't ask me for any tips on how to gate!" Team manager Garry May who re-emphasised that the word "losing" doesn't feature too prominently in his vocabulary was more than content with what he had seen during the on-track practice session, stating that "I have seen some good signs from all the lads over the two practice sessions we have stage here. Our new German Valentin Grobauer was seeing the place for the first time today and he looked at ease with it and I remain sure that he will be able to do a good job for us, especially at home. Obviously, he will be seeing all the tracks for the first time, but he is so keen and professional I reckon that he will quickly be able to weigh them up. Our reserves, Henry (Atkins) and Anders (Rowe)should certainly be able to hold their own against most of their opposite numbers. With the points limit as it is most clubs have had to bring in two-pointer reserves and I remain confident that we have two of the best of them here at Somerset." 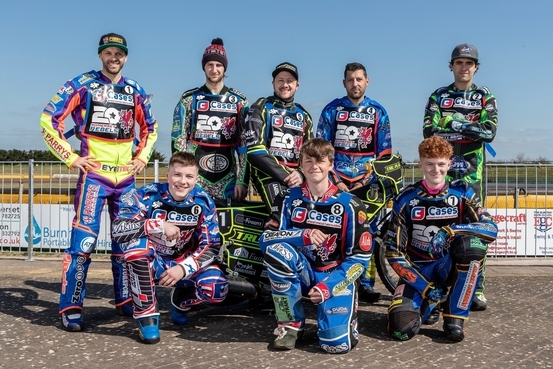 "We just want the season to start now and we are itching to welcome Poole next Wednesday (3rd April) in our 20th Anniversary Challenge fixture. It might be labelled a challenge but it is a meeting and that means it is a meeting I want to win." For one night only however, Anders Rowe will step into the opponents’ quarters and ride for Poole, and the Rebels will use Paul Starke as a 'guest'. Club promoter Debbie Hancock has confirmed that still a few tickets remain for the club’s Anniversary Dinner to be staged on Saturday 6th April. Tickets are priced £30. With a two-course dinner to enjoy followed by amusing anecdotes from speedway’s best loved double act of Nigel Pearson and Kelvin Tatum MBE, the event will be attended by riders from the last two decades, including Jason Doyle. Neil Collins, Steve Bishop and Jordan Frampton. Ms Hancock said “We have done very well with ticket sales but have a just a few more to go. We are keen to make this a sell-out and hopefully by the end of the week we will achieve that target. If anyone would like to order their tickets now then I would urge them to call us on 01278 782216.